Introducing St. Rose High School's new Rotating Drop Schedule that will be implemented during the 2019-2020 school year. 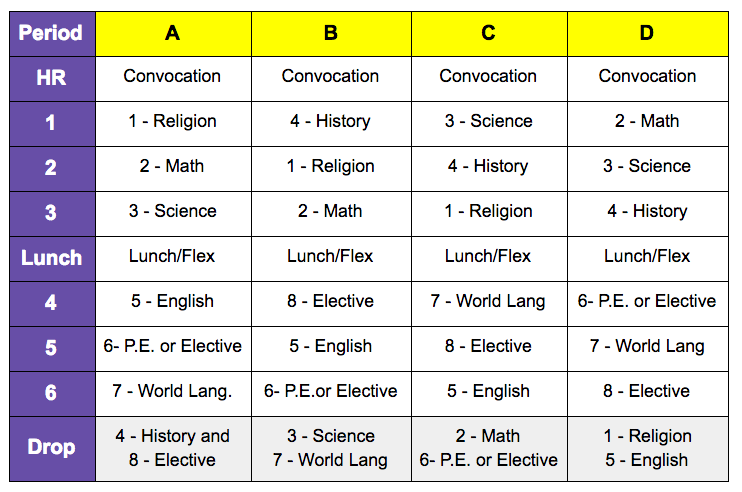 Please be mindful this is not a block schedule. The Rotating Drop Schedule does exactly what it is called. The students will have eight classes however, six classes meet each day and two classes do not meet on that day. Different classes are dropped each day and after a four day cycle all eight classes have been dropped once. Each day during the cycle, a morning and afternoon class will be dropped. After four days the cycle will repeat itself. The Rotating Drop Schedule will afford our students many valuable opportunities. Instructional time will increase as classes will meet for 52 minutes as opposed to the current 41 minute classes. Extended instructional time will allow teachers to engage students using various innovative teaching strategies. Also, the drop schedule will allow our students to take eight classes as opposed to seven classes under the current schedule. Students will have the opportunity to take elective classes in the arts, music, engineering, theater, social studies and business. Additional AP classes will be available and juniors and seniors will have the opportunity to take college credit classes through Seton Hall University’s Project Acceleration. Under the new schedule, our students will be taking four additional classes during their four years at St. Rose High School. A Flex Period also will be part of the daily schedule. Students will be able to attend daily tutorial sessions at academic centers representing all disciplines. A homework center will provide the opportunity for students to study and work on individual and group projects. Other students will be allowed to attend club activities that are required to meet on a regular basis. The 2nd column represents Day A in the 4 day cycle. On the bottom of Column A you see the periods that were dropped on the first day of the cycle. History is dropped on Day A but you can see history appears on a diagonal in the B,C and D Day columns. The students elective class is also dropped on Day A but you can also see the Elective Class also appears on a diagonal in the B,C and D Day columns. In the bottom of the B,C, and D Day columns you can see the classes dropped on those days and they will appear in the other columns. The Flex periods will be built into the lunch periods. We have spent the past two years, researching the best practices for the most effective and innovative high school schedule. That journey has led us to the Rotating Drop Schedule and we are looking forward to the implementation of our new schedule. If you have any questions about the new schedule, please contact Admissions via email here, phone x305, or use the Facebook Messenger in the lower right of your screen. We look forward to answering all of your questions.